Mystic Villa is located on a St. Jean hillside and is ideal for a family with older children, four couples, or a group. The beach is a two-minute drive away, and restaurants are even closer. A four-wheel drive vehicle is needed to access the property, but once you get there, it will all be worth it. Mystic Villa enjoys privacy and has a pool for when you’re not down at the beach. 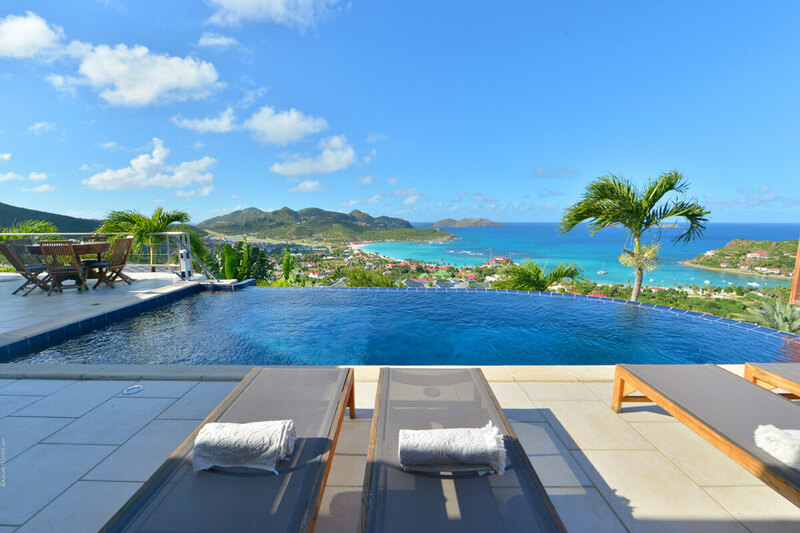 Mystic Villa is located on the St. Jean hillside with a panoramic view of the beach and the sea. Daily housekeeping, WiFi, and an open design make this villa the perfect backdrop for an island vacation. The semi-circle pool has dark blue tiles and ocean views. Teak lounge chairs surround the pool, and an al fresco dining table sits by the corner. A large canvas stretches over the outdoor lounge, and an open-air kitchen sits nearby under the gazebo. This kitchen has stainless steel appliances, more al fresco dining, and breezy curtains that filter the island sunshine. There’s also a shower head attached to one of the gazebo’s wooden beams for rinsing off before dinner. The dining area blends into Mystic’s modern living room, which features a flatscreen TV, avant-garde art, and sleek furnishings. Each of the villa’s five bedrooms also open to the garden or pool deck. The bedrooms have king beds, private access, air-conditioning, and ensuite bathrooms with rain head showers. One suite has two twin beds that can convert into a king, and another is alone on the lower level. St. Jean is one of the most developed portions of St. Barth, and is filled with shops, restaurants, supermarkets, and local businesses. World-famous Nikki Beach and Eden Rock Hotel have homes on St. Jean, and Mystic guests can drive to both in minutes. St. Jean beach is a 2 minute drive.